We are guilty. We admit it, we were the ones that balled up the piece of bread and stuffed it behind the piano until it grew mold and started attracting rats. The key marks on your new car? That was us. The body on the side of the mountain, only identifiable by dental records. Blame us. Graffiti in the bathroom, millions of dollars "lost" in Iraq, bad daughters who don't call their mothers. Guilty as charged. We are accountable for all sins, small and large. Join us Sunday, April 24th to gawk at our burdened consciences. Matthew Siegel is a poet, essay writer and educator from New York. He has poems are forthcoming in Gigantic Sequins, Indiana Review, The Lumberyard, Lo-Ball, and Saw Mill Online. He is a Wallace Stegner Fellow at Stanford University and lives in San Francisco. Shideh Etaat is a writer from Los Angeles who likes words, but likes the people who read her words even more. Her articles have been published in The Santa Barbara Independent, Javanan Magazine, and her poetry can be found in Flatmancrooked’s Slim Book of Poetry, the Atlanta Review Iran Issue, as well as the forthcoming anthology Love and Pomegranates. 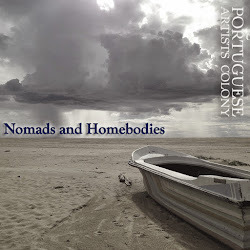 She is the 2010 Glimmer Train Fiction Open Finalist as well as the 2010 Semifinalist for the Nimrod Literary Awards- Katherine Anne Porter Prize in Fiction. She is hard at work on her first novel- The Book of Dastans. She deserves a glass of wine. Vote on a prompt as you enter the show, and four writers will write on the winning topic while you watch them sweat, swear, and get inspired. Each writer will read what he/she wrote, and you get to vote on which piece you'd like to see developed into a finished story/poem/rant to be read at the next PAC performance. We have a hell of a lineup this month - place your bets now! 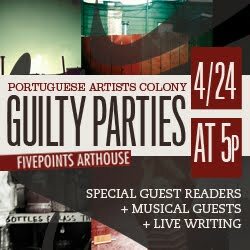 Portuguese Artists Colony is now accepting submissions! Send us your work, and have your chance at a spot behind our legendary lectern.